Herbs and spices are traditional spell ingredients. Witches add them to powders, potions and pouches as well as putting them into food for extra oomph as well as extra flavour. You can also combine them with candle magic. Here are a few ways to do that, using suggestions from my book Pagan Portals - Candle Magic: A witch's guide to spells and rituals. You can place herbs or spices around the base of the candle and leave them their until the spell is complete. However, if you want to make more of a connection between the candle and the added ingredients, the simplest way is to sprinkle a pinch of a finely ground dried herbs onto a candle either before or after it is lit. It won’t stay there, of course, unless the candle is well melted, so you need to make sure the candle is in a suitably large and fireproof container to catch the potentially burning bits of plant matter. A big cast iron cauldron is ideal. One way to make the herbs stick is to first coat the candle with olive oil or almond oil (this is often called 'dressing' or 'annointing'), then you can roll the sticky candle in the herbs or spices. Sprinkle the ground herbs on some greaseproof paper or into a dish larger than the size of the candle. Pick up your oily candle and roll it in the herbs until they have stuck all over. Then place the oily, spicy candle into a candle holder and voila, your candle is prepared. Do be aware the herbs and oil won’t be particularly strongly attached to the candle. They will come off on everything that comes into contact with them. They can also catch fire as the candle is burning down, so make sure the whole lot is sitting in a suitable fireproof container (that cauldron again). Ideally, I like to bond them more permanently and less messily. If you make your own candles, you can add herbs to the wax when it is melted, before pouring it into the mould or container, but not everyone has the time or patience. 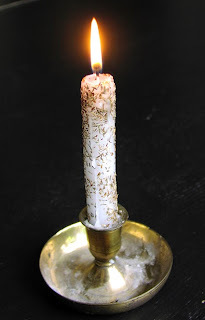 Here is a nice, easy trick to coat ordinary candles with herbs to spice up your spellwork. You need the herbs to be quite fine. If they are too big and chunky, crush them with a pestle and mortar, then put the herbs into the deep container. Plug in your hairdryer, turn it on, and use the hot air to slightly melt the surface of your candle. Make sure you point the hairdryer away from the pot of dried herbs or you will blow herbs all over the place. Roll the candle in the container of herbs so they stick to the candle. It is best to do this a bit at a time. Just use the hairdryer on an inch or two of candle, then coat that bit with herbs, then do another section of the candle, then coat that in herbs, and so on. Every so often, leave the candle to cool and solidify, otherwise it will be too sticky to handle. Once the candle seems coated in herbs, go over it with hot air a few more times so the wax really soaks in. You can do this several times, cooling it off in between. This not only makes sure the herbs have really stuck to the surface, it also makes sure the wax has permeated the herbs. It might seem a little strange, but if the herbs are really soaked with the wax, they will be less likely to catch fire when you burn the candle normally. I coated the candle in the picture at the top with thyme - mainly because I had a jar of it on my kitchen shelf that needed using up. However, thyme is a good herb to use for spellwork as well as in cooking. According to A Kitchen Witch's World of Magical Herbs and Plants, by Rachel Patterson: "It is an excellent herb to use in any healing workings (and in culinary use for healing too). Also use it in incense blends to purify and cleanse your home and bring love and peace in. Thyme will increase your willpower and give you courage." I think burning it on a candle works as well as adding it to incense blends, and peace, love, health, willpower and courage are good things to have. I made my wish for them as I lit my thyme candle and watched it burn down. You can order my book Pagan Portals - Candle Magic via Amazon or buy it at Treadwell's Bookshop, in London. The usual safety advice applies: never leave burning candles unattended. The picture at the top shows my thyme candle. So cross's with myself that I didn't book in time your candle work shop at tread wells! The workshop is likely to get run another time.